AVOID WINDOWS VIRUSES AND MALWARE - USE LINUX INSTEAD!! YOUR COMPUTER CRASHED? KEEP WORKING WITH DASLIN: YOUR COMPUTER ON A STICK! Your Computer on a Stick! Viruses, other malware, or corrupted system files are the biggest causes of crashed Windows systems. But once Windows has crashed, how do you start the computer to run a virus scanner, or seek assistance from friends or computer forums online? 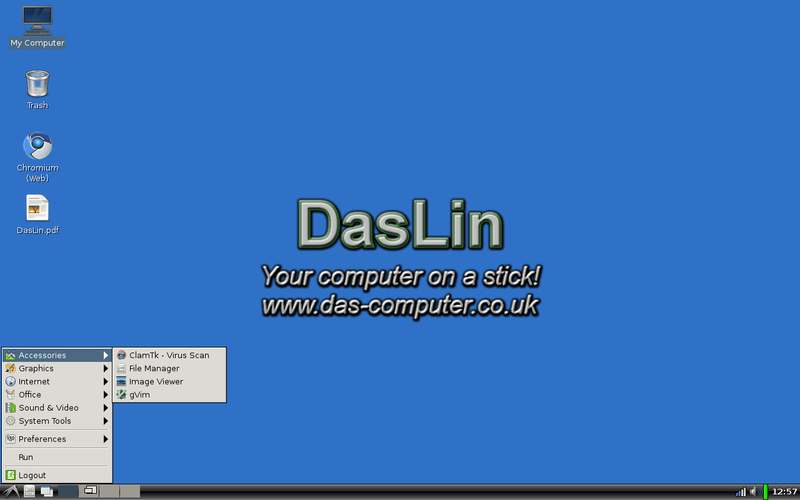 With DasLin, you can plug in, boot up, and scan your Windows system for viruses. You can also get online to find guidance on how to fix your Windows system. DasLin: Your Computer on a Stick is the perfect tool for when your computer is having problems. It lets you carry on working with its included web browser and office software, and access to your files on the hard disk. It also lets you scan your Windows system for viruses and remove them, and browse for advice online for how to fix your windows system. A clever virus can potentially modify the infected system such that it cannot see the infected and altered files. DasLin, running from outside the infected system, would not be affected by this issue. Windows is sometimes unable to move or delete an infected file when it is currently being used. When scanning files from DasLin, none of the Windows system files are in use so they can be altered or quarantined as required. There is a great deal of free advice on the internet to help you fix your windows system. Now you need it because your computer has crashed, but you can't access it ... because your computer has crashed. Using DasLin, you can get online to read about your computer problems and get advice on how to fix them. Use DasLin when you need to carry on working despite a slow or crashed computer, or use it to fix your Windows system. Find out more about Daslin, or buy DasLin online today.